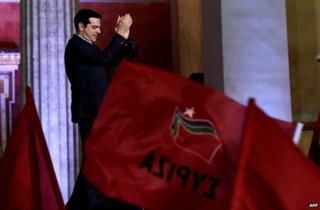 When Greece's new Prime Minister, Alexis Tsipras, gave his victory speech flags were flying high. Supporters of his left-wing Syriza party gathered from across Europe to celebrate an event which they are hoping will change the continent. Their euphoria seemed tinged with apprehension. Old friends embraced and kissed as they recognised each other on the square. Perhaps they were comrades from the early days, when Syriza was struggling to attract more than a few percent of the vote. I say the early days, but that was only five years ago. Things are changing fast. "It's the beginning of a new era," said Poppy Kotsiandi, a little uncertainly, putting a protective arm around her teenage son. "What do you do?" I asked. Poppy didn't quite fit the image I had of a typical Syriza voter. "I'm freelance," she said, evasively, "in advertising." Work is scarce. "There will be tough times ahead," mused her friend Yanis, a studious-looking man in middle age who said he sold life insurance for a living. Where were the firebrands? Where the militant Marxists? Why were these polite, middle-class professionals waiting for Alexis Tsipras to sweep onto the stage and usher in the first ever radical leftist government in the European Union? They were the same sort of people as the elderly lady I'd seen the previous day - dressed in a smart, dark blue skirt below the knee and matching jacket, her hair immaculately blow-dried - scavenging for leftover vegetables in the market as the stallholders cleared up for the day. They were what would, in any prosperous nation, constitute the political middle ground. Back in 2001, that arch-centrist, Tony Blair, said: "The kaleidoscope has been shaken. The pieces are in flux." He was speaking a few weeks after 9/11 - a different era. Today, it is the European consensus that lies in broken shards upon the pavements of Athens. To give you an idea of how fractured and confused politics is in Greece right now, let me recount a conversation I had with a Greek journalist before the election who was explaining to me why he wasn't planning to vote Syriza. The reforms imposed upon Greece by the International Monetary Fund (IMF) and the EU - while painful - were a necessary step, he said, to shake the country out of a state of moribund corruption. "You probably think I'm really right wing," he added, apologetically. "I'm not, honestly, I'm very centrist. I love Marx." In that context, can it be surprising that Syriza has chosen as its coalition partner not the communists - who you'd think might be their natural bedfellows - but a group called Independent Greeks? They're a centre-right anti-immigration party whose only common ground with Syriza is their shared opposition to the policies of austerity. On pretty much everything else they disagree. But Syriza needs to move fast, and a fractious coalition is going to be the least of their worries. Greece is about to start negotiations with its creditors. Neither side knows what the rules are anymore. But in essence, here's the deal - a coalition of radical left groups that believes capitalism is a bad thing now runs a country that owes around 280 billion euros (£210bn; $320bn) to institutions that are wedded to the economics of the free market and whose credo is austerity. For each side to come out of this confrontation intact, both will have to compromise. Failing that, one of the two will break. And the EU could be the one to crack. In other European capitals, that thought fills many with dread. But not all. Athens has become a beacon for thousands of leftists, who are flocking to Greece to be part of what they hope is the beginning of a revolution. On the square - as Polly, Yanis and their fellow Greek voters waited for the new prime minister - a group of 200 Italians unfurled a bright red banner. "L'altra Europa con Tsipras," it read - "An alternative Europe with Tsipras." Mingling among them were dozens of young men and women in purple T-shirts emblazoned with the Podemos logo. Podemos is Spain's answer to Syriza, and they believe their country could be next when they hold general elections later this year. British Marxists, French socialists, they all joined in the celebrations, as Patti Smith's anthem People Have the Power blared over the loudspeakers. This is surely not what Tony Blair had in mind when he addressed the Labour Party conference. "This is a moment to seize," he had said back then, to a political party he'd dragged kicking and screaming from the left into the centre-ground. "The kaleidoscope has been shaken. The pieces are in flux. Soon they will settle again," he went on. "And before they do, let us reorder this world around us." That was October 2001, and the world was reordered. It may be about to happen again. BBC Radio 4: Thursdays at 11:00 GMT, Saturdays at 11:30 GMT.